The Headliners Squad of FIFA 19 Ultimate Team was announced. Let’s see who were the players chosen for these dynamic items. Introducing FUT19 Headliners, a brand new event centred on players who are on an exceptional run of form during the season so far. Each FUT19 Headliners player is released on a brand new item type which dynamically updates in a unique way. 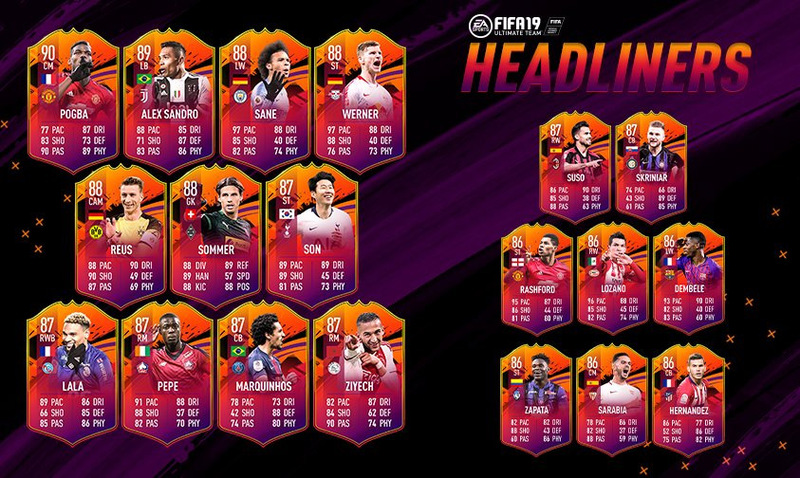 At the launch of the event, each FUT19 Headliners player item type is released at one in-form upgrade higher than their latest qualifying performance based in-form (TOTW, MOTM, Hero, Record Breaker or Team of the Group Stage item). Each time the FUT19 Headliners player earns a subsequent qualifying performance based in-form, their FUT19 Headliners player item type will dynamically increase to always be one in-form upgrade higher. A such, The FUT 19 Headliner upgrade will always stay one in-form ahead of the most recent qualifying performance based in-form throughout the remainder of the season. Paul Pogba (Manchester United) – He’s been on a tear since the managerial change at Manchester United, scoring 6 and assisting 4 under Solskjaer. Alex Sandro (Juventus) – No Serie A squad is complete without Alex Sandro at Left Back. The Brazilian is having one of his best seasons to date, helping Juventus keep 15 clean sheets as they look to lock their 8th consecutive league title. Yann Sommer (Borussia Monchengladbach) – Sommer is in rare company with 3 TOTW In-Forms to his name so far this season to go along with 9 clean sheets, and it’s hard to see him slowing down as Monchengladbach seek to secure a UEFA Champions League spot. Timo Werner (RB Leipzig) – Werner has continued to build on his form from last season with 13 goals in all competitions, surpassing his In-Form count from last year with an impressive 3 TOTW honours this season. Marco Reus (Borussia Dortmund) – The feel-good story of a great player returning from long-lasting effects of an injury, Marco Reus has regained top form this season, with 15 goals and 11 assists in all competitions, and hasn’t show signs of letting up. Leroy Sane (Manchester City) – The German prodigy is on course for his best season yet, already scoring 11 and assisting 13 in all competitions for Manchester City. Kenny Lala (Strasbourg) – With an impressive 3 In-Forms earned already, Lala has established himself as the go-to Right Back in any French/Ligue 1 FUT squad. Nicolas Pepe (Lille OSC) – With a prolific 15 goals and 7 assists in 22 matches, Pepe is the key reason Lille as currently second in the league. Suso (AC Milan) – The driving force behind Milan’s resurgence, he has been involved in more goals than anyone else on the squad this season, scoring 5 and assisting 8 in league play. Hakim Ziyech (Ajax) – Playing for one of Europe’s premier talent factories, Ziyech show no signs of letting up as he bossed the first half of the season getting named Man of the Match 9 times while scoring 13 and assisting 11. Heung-Min Son (Tottenham Hotspur) – The aptly nicknamed Sonaldo is off to a blazing start this season, with 9 league goals and 5 assists from 18 appearances. Marquinhos (PSG) – The Brazilian center-back is on track for his best season yet with Paris Saint-Germain since making his move to the French capital 5 years ago, with 11 clean sheets and 3 goals in all competitions. Milan Skriniar (Inter) – In only his second season at the club, the Slovakian center-back has made it clear that he is the foundation of Inter’s back line, helping the club keep 11 clean sheets in all competitions. Hirving Lozano (PSV Eindhoven) – The Mexican winger continues to impress in the Eredivisie and already has 2 TOTW In-Forms half way though the season, from a prolific 17 goals and 9 assists in all competitions. Duvan Zapata (Atalanta) – Unstoppable comes to mind when describing Duvan Zapata’s current form, the Colombian striker is scoring almost a goal per game in the first half of the season and has already surpassed his tally from last year. Ousmane Dembélé (FC Barcelona) – Injury took it’s unfortunate toll on Dembele when he made a big money move to Barcelona but this season the young Frenchman looks on track to finally show the world why he was so highly touted, scoring 6 goals in his last 10 matches alone. Lucas Hernandez (Atlético Madrid) – The versatile defender continues to go from strength to strength throughout 2018, this season Hernandez has been an integral part to the Atlético defensive unit, who lead La Liga for Clean Sheets. Marcus Rashford (Manchester United) – Lauded by the new United boss for “playing the best football in his career”, Rashford’s goal return has improved dramatically under the tutelage of the baby faced assassin. Pablo Sarabia (Sevilla) – The numbers paint the picture when it comes to Sarabia, 17 goals and 9 assists is his tally so far in all competitions this season, from midfield no less. Watch out for 3 additional FUT19 Headliners to be released through SBCs and objectives during the course of the event.